A sensational and explosive combination of roasted sweet yams, crunchy corn, black beans in a light jalapeño dressing.. This recipe is from Holly Clegg's Trim & Terrific Gulf Coast Favorites: Over 250 easy recipes from my Louisiana Kitchen. Preheat oven to 425 degrees. Line baking pan with foil and coat with nonstick cooking spray. On prepared pan, toss together sweet potatoes, salt and pepper and 1 tablespoon olive oil. Roast about 30 minutes or until potatoes are crisp. Cool. 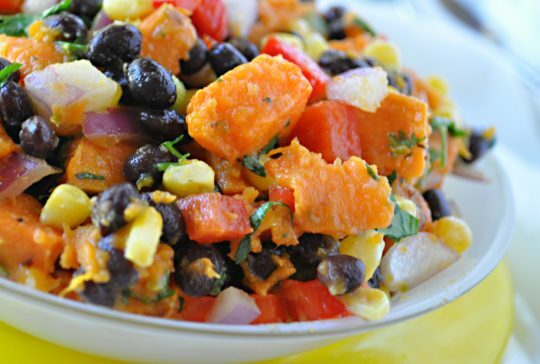 In large bowl, combine sweet potatoes, red bell pepper, red onion, corn, black beans and cilantro. In blender, puree lime juice, garlic, jalapeno and remaining 2 tablespoons olive oil. Toss with potato mixture and serve. This recipe makes 12 (1/2-cup) servings. Nutrition Nugget: Their rich orange color lets you know sweet potatoes are rich in vitamin A and powerful anti-inflammatory antioxidants. Recipe from Holly Clegg's Trim & Terrific Gulf Coast Favorites: Over 250 easy recipes from my Louisiana Kitchen. For more of Holly's easy healthy recipes and tips, visit her Blog and YouTube channel.